In my daily life as an intrepid journalist, I always strive to be fair and objective. It isn’t always easy, but I’m glad to see my efforts have not gone unnoticed. To wit: “fair and objective” was one of the top responses in a recent poll of readers when asked to describe the content of fantasticdrivel.com. I can’t say I’m thrilled that the top two responses were “long-winded” and “confusing,” but “fair and objective” was a very close third. I bring this up, not to toot my own proverbial horn, but to preface an apology. Despite my tireless dedication to being fair and objective, I am afraid that part five was a bit unfair to you, dear reader. By merely providing the fenghuang descriptions without any legitimate attempt at constructing a visual diagram, I did not deliver the same caliber of journalistic excellence you have come to expect from this widely-unread publication. I was being lazy—and that was not fair to you. According to scripture Erya – chapter 17 Shiniao, Fenghuang is said to be made up of the beak of a rooster, the face of a swallow, the forehead of a fowl, the neck of a snake, the breast of a goose,* the back of a tortoise, the hindquarters of a stag and the tail of a fish. Given the relatively generic language of the Erya (a really, really old Chinese dictionary), it is difficult to generate an authoritative composite for the fenghuangs of antiquity. After some careful research, however, I believe I have avoided the pitfalls of anachronism and biogeographic ignorance. 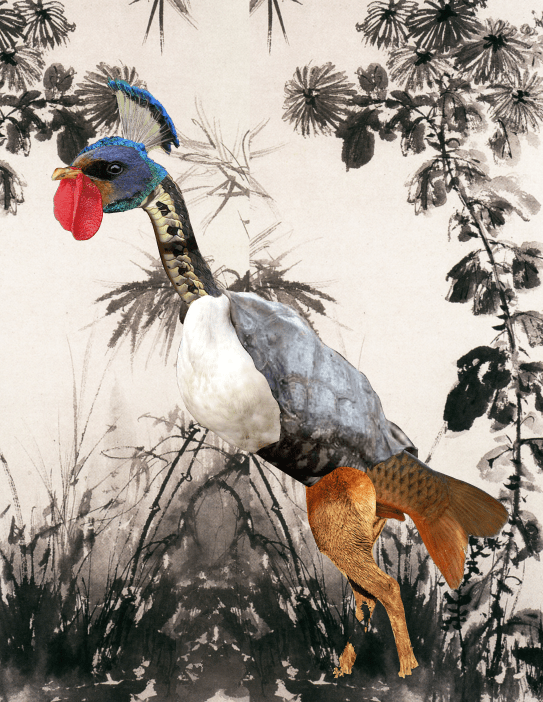 Even an armchair mythological ornitholigist in third-century-BC China would have had some familiarity with the component species of this reproduction. cf. “thermidor,” ogled in zw2.05, and zw3.03. The exact timeline is a bit fuzzy, but somewhere over the course of the last two-thousand years the ruler of birds decided to change her look. 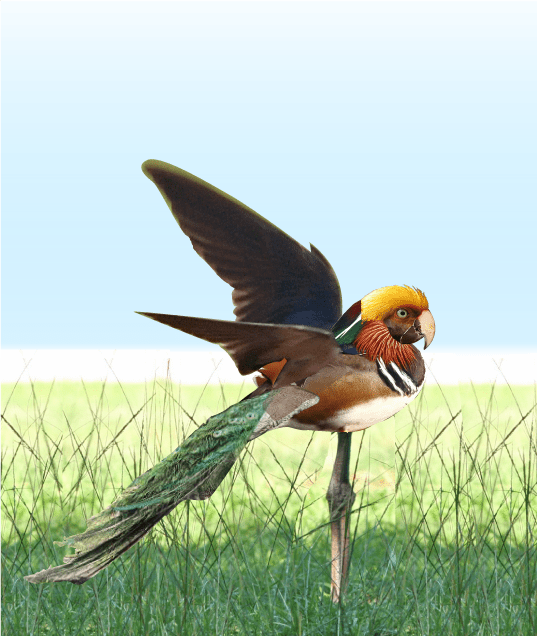 Today, however, it is often described as a composite of many birds including the head of a golden pheasant, the body of a mandarin duck, the tail of a peacock, the legs of a crane, the mouth of a parrot, and the wings of a swallow. I think most would agree that the fenghuang’s radical makeover results in a specimen that is much easier on the eyes. As you may recall from part five, the fenghuang is today considered a feminine entity. This was not always the case—the fenghuang has been yinned-up a good deal over the years. The softer, gentler, prettier fenghuang we know today is a much better representative of all things yin. Consequently, it is a much better counterpart to the Chinese dragon, the yangest of all beasts. I realise, of course, that we have not really covered any new material here in part six. But I feel I have atoned for my unfair behaviour in part five, now that I have provided the kind of graphic journalism you’ve come to expect from fantasticdrivel.com. I give you my word: part seven will tie it all together. Don’t miss it. This entry was posted in facebook ads, zoo world, zw3: pulchritudinous pandas and tagged apology, breast, confusing, crane, dragon, erya, fair and objective, fenghuang, fish, fowl, golden pheasant, goose, long-winded, mandarin duck, peacock, rooster, snake, stag, swallow, tortoise, yang, yin, zoo world by Hank. Bookmark the permalink.